NEW BLOG and a book signing! Lots of exciting things have been happening. The surgery went amazingly well, to the point where I am healthier and happier than I’ve ever been. More on that soon. As of now, I’m 55 days in… And it’s been rocking my world! There is #realtalk, humor, poetry, stream of consciousness, attitude, doodles, and whatever the heck wants to come out. Head over there to follow along as I journey toward my big giant heart-goals by embracing chance/happenstance/serendipity… rather than trying to control everything. 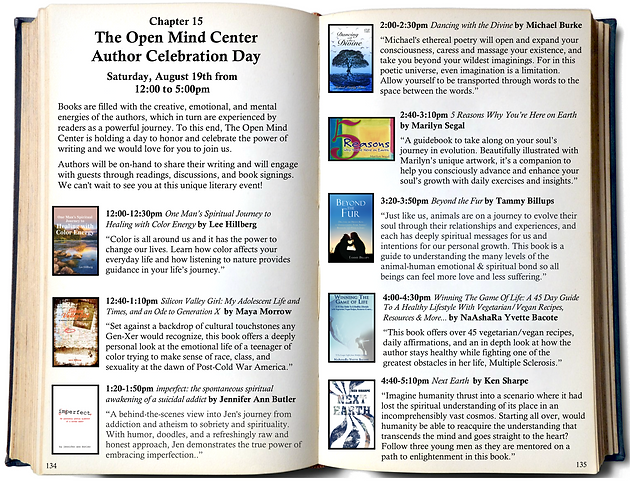 BIG THING #2: I have a book signing for my first book, “imperfect: the spontaneous spiritual awakening of a suicidal addict” this Saturday, August 19th at The Open Mind Center in Roswell, Georgia. The event is an author appreciation gathering, with 7 other authors, all with heartfelt books to share. My presentation runs from 1:20pm-1:50PM. The entire event spans from 12PM-5PM. Come show your support and see my super awesome signature that I’ve been practicing since I was a kid! That’s the end of Jen’s guest post. Thank you, Jen! Now I can promote my appearance at the very same event! Yes! Because as synchronicity would have it, I met Jen at a special gathering for spiritual women, generously hosted at the home of a mutual friend in Cobb County last month. Jen and I found ourselves seated next to each other; we then found out we’re both writers and have lots of other things in common, so of course we exchanged books right there on the spot. You can find my review of Imperfect here on Amazon and here on Goodreads. Jen was selected for the Author Celebration Day at the Open Mind Center, then immediately sent me an email, saying they had one more spot left for a presenting author and I should call the coordinator RIGHT NOW. I had a scheduling conflict and began an email, responding to Jen and explaining that I wasn’t sure my book would even be a match for this type of event, and as I was thinking through all the reasons this was probably not the right opportunity for me, a little voice inside said, “Stop thinking and just CALL NOW. This is definitely the right opportunity for you. Just say YES.” And so I called the number Jen had given me and introduced myself and said I’d been referred by Jen who said they had one author spot left, but I wasn’t sure if my book was a fit for the event. I told her a little about it and at her request, emailed her a synopsis and author bio, as well as links to my Amazon and Goodreads author pages. She said she’d look the material over and call me back to let me know if she thought I (and my book) were a fit. Charmaine (at The Open Mind Center) called me back a few minutes later. She enthusiastically said she loved what she’d read, my book was a perfect fit for their Author Event and Book Celebration Day, and immediately emailed me the enrollment forms to fill out so I could participate as a featured author. She also asked that I send her a copy of the physical book so they could set it up properly in their system to sell onsite. I am so deeply grateful to Jen and Charmaine for this wonderful opportunity. THANK YOU. I am humbled, and my heart is so full and I can’t wait till this Saturday and I hope you will come out and be a part of it. I also have a personal connection to Roswell. I actually lived there from 1982-1984 (age 10-12) and I have lots of fond memories there. As you can see on the event flyer, I will be speaking and presenting on Silicon Valley Girl: My Adolescent Life and Times and an Ode to Generation X from 12:40-1:10 PM. I am so super stoked and excited. This is going to be so much fun, and a great opportunity to meet other like-minded people in the spiritual community as well. They had me at Reiki.